This post is sponsored by 4Knines and the BlogPaws Professional Pet Blogger Network. 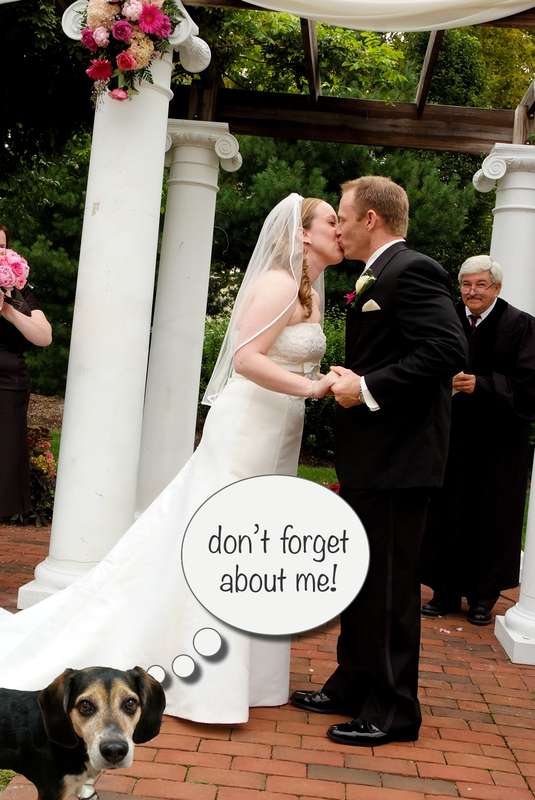 I am being compensated for helping spread the word about 4Knines Products, but Newlywed Survival only shares information we feel is relevant to our readers. 4Knines is not responsible for the content of this article. Sometimes when a couple gets married, they not only marry each other but also a pet. This was the case with my husband and I. I had my beagle, Honey, for about 4 months before I met Dan. When we started to get serious, I think he realized that he was not only getting serious about me, but also about Honey. Dan is definitely a dog person, but he had no say in choosing Honey. It also didn’t help that I had created a little monster in the 4 months prior to meeting him. So, he had some things to get used to. Although Dan grew up with dogs, he hadn’t had one in years. One of the things he had to get used to was having hair everywhere! Hair on the floor, in the bed, on the couch, and in the kitchen. The first time he saw a hair on his dinner plate, he looked like he was going to throw up. Slowly, he has grown used to the hair. It helps that he is MUCH better with cleaning than I am. We take Honey in the car with us all of the time. This means that the dreaded shedding hair has built up in the back seat of the car. We started out with good intentions… placing a blanket over the back seat. As you can imagine, just like in the photo above, she had that thing all over the place and her hair just ended up on the seat anyway. We got to a point where we were used to having the car smell like a dog and never being able to have people sit in the back seat (unless they wanted hair all over their clothes). 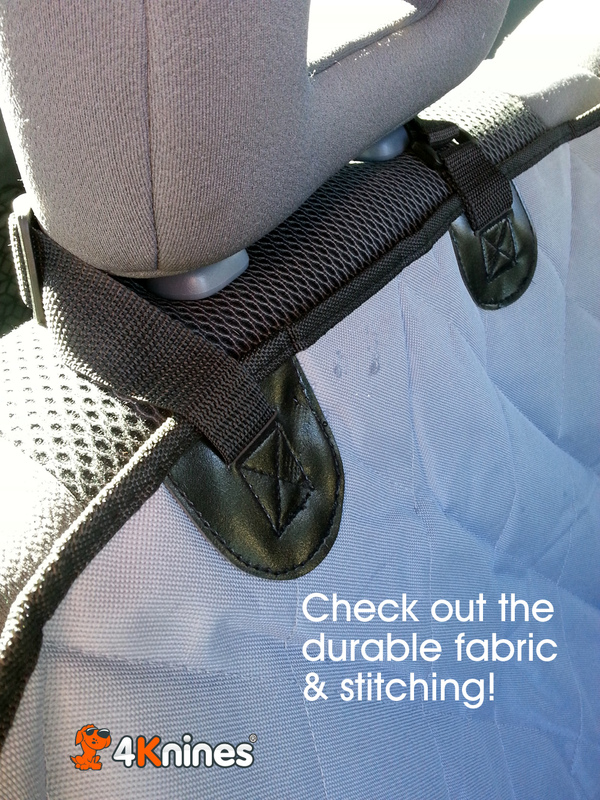 Recently we got the chance to test out the 4Knines dog seat cover for the rear seat of our car. It is awesome! I love that it anchors to the headrests and has a nonslip backing that keeps it in place. She can’t roll this up in ball like the blanket! It is made of durable, waterproof material so when it rains, her wet paws won’t get on the seat and it will easily wipe down with a damp cloth. I can imagine that it would be great for people with children too… no more juice spills on the seats! Not only does 4Knines make an excellent rear dog seat cover, they also make a dog seat cover for the front seat, a cargo liner and a bed liner. All of them come in different sizes and colors. Now that the car no longer smells like a dog, my hubby is moving on to the house and has his eye on the waterproof dog bed liner next. When I checked out the 4Knines website, I was pleased to find out that they support numerous pet advocacy groups including the Arizona Humane Society, Soldiers Best Friend, Marley’s Mutts, and Desert Harbor Doberman Rescue. Plus, they donate $1 to the ASPCA for every product sold. Are you ready to buy? Check out their products and take advantage of their Black Friday / Cyber Monday 20% off Sale! 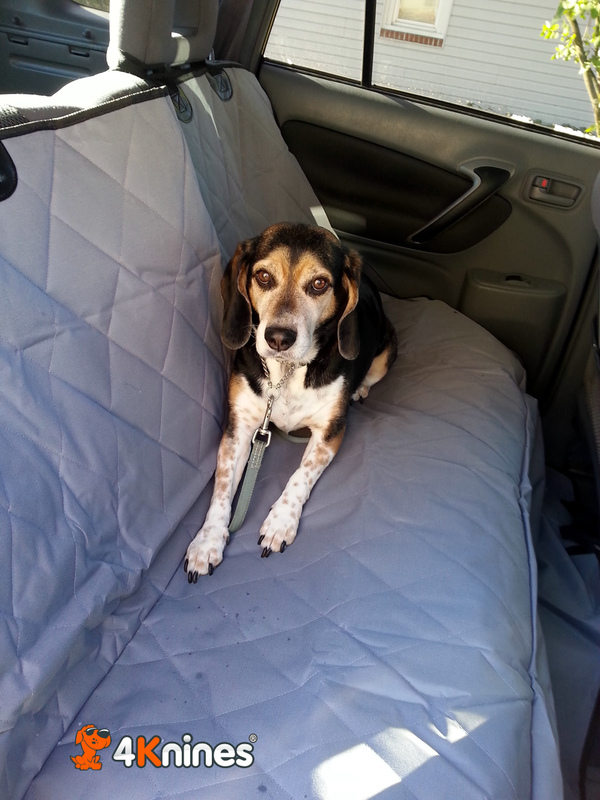 Now that you know how great our dog seat cover is, why not try to win one of your own? Enter using the form below and you can win a 4Knines rear seat cover in the color of your choice! Giveaway is open to U.S. residents age 18 and older. Void where prohibited. Please allow 4-6 weeks for delivery of prize. Giveaway ends at 11:59pm EST November 30, 2014. I can imagine the hair really shows on an all black interior! This would be great for you. I need the rear seat cover so bad! We have three big dogs and they always want to go with me. Also there are days I'd like to take one of them running with me when I am meeting friends at a dirt road to run, but I took him once and he got muddy paws all over the back seat. Ugh. I could really use one of the rear seat covers. I have an old bedspread draped over the seat now, could really use something that looked better. This would definitely look better! I'd choose the gray backseat liner. I'd give it to my son so that the next time I have to ride some place in his vehicle I can get out and not be covered in dog hair! The full back seat in dark brown for my 3 dogs!!! The REAR SEAT COVER that would really be handy. I could also really use the extra large cargo bed liner. The black Rear set cover because have a Lab/Pitt mix pup .